In this image of the giant asteroid Vesta obtained by NASA's Dawn spacecraft, numerous impact craters illustrate the asteroid's violent youth. NASA will showcase the latest discoveries from an asteroid probe orbiting the huge space rock Vesta on Thursday (May 10) in a press conference for reporters and the general public. 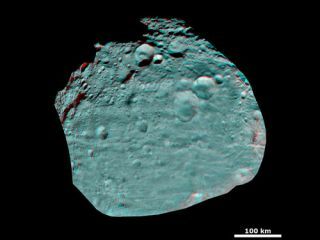 The conference, which will begin at 2 p.m. EDT (1700 GMT) on Thursday, will present a new analysis of Vesta based on the latest observations from NASA's Dawn spacecraft, which has been orbiting the asteroid since last July. The $466 million Dawn spacecraft launched in 2007 on a mission to visit two huge space rocks in the asteroid belt that orbits the sun between the orbits of Mars and Jupiter. David O'Brien, Dawn participating scientist, Planetary Science Institute, Tucson, Ariz. The space agency's social media fans can also ask questions about Vesta via Twitter by using the hashtag #asknasa, NASA officials said in an announcement. Last month, NASA extended Dawn's stay at Vesta by an extra 40 days to give the spacecraft more time to study the asteroid. So far, the spacecraft has revealed that many new details about Vesta, including that it is rich in iron and magnesium, and experiences chilly temperatures that range from minus 10 degrees Fahrenheit (minus 23 degrees Celsius) in the sunlight, to minus150 degrees F (minus 100 degrees C) in shadowed areas. Scientists think Vesta is a 4.5 billion-year-old relic left over from the formation of the solar system. NASA's Dawn spacecraft is the first spacecraft ever aimed at visiting two asteroids in the asteroid belt. In August the probe will move on to the Texas-size Ceres, the largest object in the asteroid belt and a space rock so large it is considered a dwarf planet. The Dawn probe is expected to arrive at Ceres in February 2015.